The most aerodynamic and fuel-efficient commercial truck on the road. 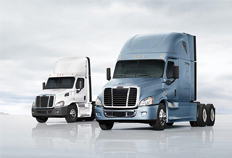 The Cascadia Evolution delivers up to a 7% increase in fuel economy over EPA 2010-compliant Cascadia Model. Designed with “total cost of ownership” in mind; this commercial truck is built to maximize profits and build businesses. This truck has a traditional look with modern efficiencies and amenities. When reliability, maneuverability and visibility are top priorities, the M2 106 is the answer. Excellent efficiency, from fuel economy to cost of operation, the M2 106 is a top choice when evaluating delivery trucks for sale. The Freightliner M2 106 is an excellent flat bed truck featuring an aerodynamic steel-reinforced aluminum cab that is strong, lightweight and corrosion resistant. It offers a choice of Cummins fuel-efficient engines and has clear frame rails back-of-cab, along with plenty of customizable features. And keeping it maintained is easy. The Business Class M2 106 is ideal for pickup and delivery. It’s easy to drive with best-in-class visibility and up to a 55-degree wheel cut. Drivers can navigate tight loading areas as well as narrow city streets. It provides plenty of comfort and ergonomics inside the cab to enhance driver productivity. 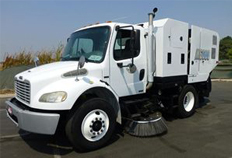 The M2 106’s excellent fuel efficiency and easy maintenance deliver more to the bottom line. 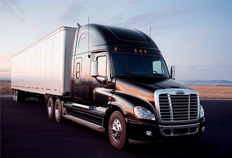 Freightliner’s moving trucks can assist in transporting a wide variety of items, from furniture to merchandise. 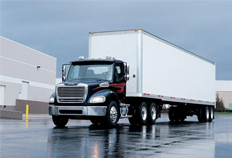 These trucks are designed to deliver excellence and the opportunity to make your business run more efficiently. 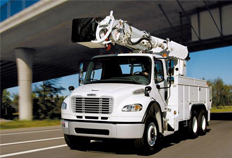 The Freightliner M2 112 commercial truck has higher horsepower and suspension ratings to handle heavier loads. 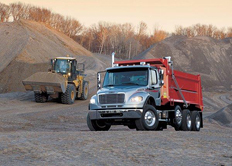 The Freightliner M2 112 is an excellent truck for both regional and short hauls. It offers up to 450 horsepower and can pull up to 80,000 lbs. with ease. The aerodynamic steel-reinforced aluminum cab is strong and lightweight to help maximize payload capacity. And the vehicle’s fuel efficiency and easy maintenance help fleet managers keep productivity up and costs down. 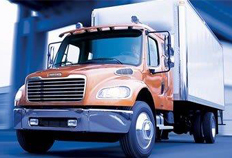 The Freightliner M2 112 is an ideal tractor for food and beverage delivery. 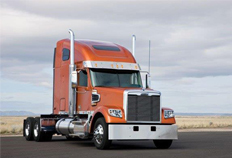 Its overall cost per mile is low, due to a combination of outstanding fuel efficiency and easy maintenance. Easy to drive, with best-in-class visibility and up to a 55-degree wheel cut, drivers will be able to navigate tight loading areas as well as narrow urban neighborhoods. And the comfort and ergonomics inside the cab are sure to enhance driver productivity. Ideal for trash haulers, recyclers, and roll-offs, the Freightliner M2 112 offers power and maneuverability for the most demanding routes. Its tight turning radius and excellent visibility make navigating neighborhood streets easier. The comfortable cab, best-in-class visibility and low step-in height keep drivers safe and productive. The fuel efficiency and ease-of maintenance make the M2 112 a great financial choice. The M2 has a variety of applications. From pickup and delivery to utility to towing, the M2 106 is one of the most popular medium duty trucks because of its exceptional flexibility, efficiency and maneuverability. 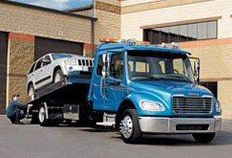 Freightliner Fire and Emergency trucks are always ready to respond. Front and rear engine power take-offs and cab configurations offer the flexibility you need. Freightliner’s M2 112 trucks are designed with performance and efficiency in mind, and our emergency trucks are no different. Freightliner’s M2 112 Food and Beverage trucks offer excellent fuel economy and ease-of-maintenance that result in an overall low cost per mile. These trucks are an incredible value on every route. 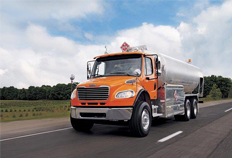 Dependable yet lightweight, Freightliner Tankers maximize payload and the torque you need. With tough components like a heavy-duty frame and a steel-reinforced aluminum cab, the 114SD outperforms others in heavy duty truck sales because it is ready to endure the most demanding jobs. From a quieter cab to ergonomically placed controls, the 114 cab is designed to make the driver more comfortable and productive. The Coronado 122SD is the ultimate work truck. These heavy duty commercial trucks can haul anything from granite to logs to heavy equipment with ease – across severe terrain, down a mountain and around hairpin curves. The interior of the 122SD cab is designed so everything can be controlled from the driver’s seat.